I have always been a fan of amnesia stories, especially ones where there’s a potential for the character to have a “do-over” when it comes to life’s myriad of little choices. Based on reviews from my friends, I knew I would enjoy Liane Moriarty’s writing. When I stumbled over What Alice Forgot at the end of the summer, it was a fantastic read from beginning to end. I say this despite the fact that from almost page one, I felt a small ball of anxiety form in my chest, as the full ramifications of what losing a decade of one’s life could cost a person. The story begins with Alice Love re-gaining consciousness after taking a fall at the gym. As Alice starts to fully appreciate her predicament, it becomes clear that her life has not turned out quite as she imagined. While Alice tries to piece together a decade of her life that she cannot remember. Not only has she forgotten her three children, Alice is blind-sided by the fact that her husband has moved out and divorce appears imminent. Her relationships that she has with the rest of her friends and family are tumultuous at best. Alice tries to come to terms with her life while frantically trying to repair all that has gone wrong. Moriarty balances Alice’s story with just the right amount of wit and drama that leaves you laughing out loud and simultaneously eye-twitching in the same chapter. It has been a very long time since I’ve had such an emotional reaction to a novel. As I followed Alice’s journey to reclaiming her memories, I had to put the book down at times because it became too stressful to continue. As Alice, bit by bit, learns the truth of how her marriage has fallen apart and the impact of that on her children, you just keep hoping that she gets a second chance to repair some of damage that has been done. Don’t get me wrong, Alice is not a horrible person, not even in the slightest. She just seems to have fallen into a pattern of choices that leads her away from the people that she cares about the most. When I started to reflect on the wreck that had become Alice’s life, I could see how easy it would be to fall into the same vortex of hurt and recrimination that she seemed to be swirling around in with almost every person that she loved. It’s the little hurts and frustrations that we take out on those closest to us because we unconsciously see them as our safe space. But is it really? One of the lessons that Alice learns is that over time, those relationship bonds are not as unbreakable as she once thought. A good lesson for all, I think. It’s finally over. After three years and three novels, I can officially consider this experiment in fan fiction complete. What I have I learned about this experience? That if you are going to tackle a classic, especially a piece of work written by Jane Austen, you had better have an unparalleled understanding of the original work before you get started. SYNOPSIS – Cat Morland is ready to grow up. A homeschooled minister’s daughter in the quaint, sheltered Piddle Valley in Dorset, she loses herself in novels and is sure there is a glamorous adventure awaiting her beyond the valley’s narrow horizon. So imagine her delight when the Allens, neighbors and friends of her parents, invite her to attend the Fringe Festival in Edinburgh as their guest. With a sunny personality, tickets every night and a few key wardrobe additions courtesy of Susie Allen, Cat quickly begins to take Edinburgh by storm and is taken into the bosom of the Thorpe family, particularly by eldest daughter Bella. And then there’s the handsome Henry Tilney, an up-and-coming lawyer whose family home is the beautiful and forbidding Northanger Abbey. Cat is entranced by Henry and his charming sister Eleanor, but she can’t help wondering if everything about them is as perfect as it seems. Or has she just been reading too many novels? McDermid’s version of Northanger Abbey was quite enjoyable for the most part. She relocated the story from Bath to Edinburgh in August during the festival season, which was the perfect backdrop for the mystery and intrigue that Catherine Moreland, or Cat is searching for. McDermid did a great job of resettling Austen’s characters in the 21st century. McDermid seems to have stayed fairly true to form, clearly establishing Cat’s naivety and lack of worldly experience with the polar opposite gold-digging, scheming Thorpe siblings and the oppressed Tilney children, trapped by an over-bearing, dictatorial father. Cat has led a very sheltered life, the daughter of a vicar and home-schooled by her mother, her only escape to adventure is through her love of gothic novels. Cat’s first real-life adventure away from home comes when she gets invited to join family friends, the Allens, on a trip to Edinburgh for the Festival. Edinburgh in August is hopping and Cat is in her glory as she gets to explore the Festival, the city and along the way, she meets some new friends. Cat encounters Bella Thorpe and her family, and the two girls become fast friends. Cat’s older brother James and Bella’s brother John decide to join the party in Edinburgh and Cat begins to see her older brother through the eyes of others as she discovers that James is already well-acquainted with the Thorpe family since he went to school with John, a character who is completely self-obsessed and who turns up everywhere that Cat goes. Bella sets her sights on capturing James’ heart, and John assumes that through his sheer force of will he can make Cat his own, despite the fact that Cat does not return his affection. There is one person that Cat wishes were around more and that is Henry Tilney. She first meets Henry at a dance class, and from that moment on, Cat can’t get Henry out of her head. Cat also gets to meet Henry’s sister Ellie, who’s friendship she comes to appreciate as it not only provides Cat access to Henry, but Cat quickly realizes just how much they share in common. As Cat jumps between spending time with Bella, James and the every-increasingly annoying John, and the Tilney siblings, finds herself juggling new emotions along with her time as she tries to keep everyone happy. As Cat becomes increasingly uncomfortable with the excessive flirtation between her soon to be sister-in-law and Freddie Tilney, the incorrigible player, she is given an opportunity to further her own desires. Cat is invited to get away from the scene in Edinburgh by Ellie and Henry Tilney who invite her to come and stay at their family ancestral home Northanger Abbey. Cat jumps at the chance to spend more time with Henry, who she is becoming more and more infatuated with, and to spend time with Ellie, who’s friendship seems to be one that has greater staying power than the unpredictable Bella. This is where the rebooted story begins to falter. Both Catherines, in this version and the original, have VERY over-active imaginations that create a lot of grief. Northanger Abbey, like Edinburgh, provides the perfect setting for a mystery, coupled with the very hushed up details of the Mrs. Tilney’s death years earlier, Cat’s imagination takes off. The Catherine of the original dreams up a murderous plot carried out by the Tilney children’s very domineering and controlling father. The Cat of the 21st century takes it to a whole new level, adding to her fantasy of possible murder that the Tilney family are really blood-sucking vampires. As a fan of supernatural fiction, this storyline thread just felt ridiculous. McDermid should have just stuck with the suspicious death plot and developed that more instead of trying to jump on a pop culture trend that is now long past over. It was so poorly tied into the story that I nearly gave up reading the novel a few times. The end of the story was also poorly managed, rushed and not believable at all. The heart of my disappointment really and truly seems to be that Austen’s stories have been completely lost in an attempt to ride the wave of the 200th anniversary of the publication of her works. Most of the authors that were contracted to complete their re-imagining of Austen’s most popular works, are very successful in their own right. Theoretically this should have equaled a win-win, but in reality, I feel the entire project has missed its mark. There is one more book in the series, Eligible by Curtis Sittenfeld, which is a re-interpretation of Pride and Prejudice, my favourite of all Austen’s works. I was really looking forward to this book, but after reading the description for it and some reviews I realized that I no longer have the stomach for the Austen Project and it’s somewhat nonsensical rewriting of Austen’s stories. My advice is if you are considering reading any of the Austen Project’s offerings, do so at your own risk. If you end up throwing books across the room or banging your head against a wall in complete and utter frustration, don’t say that I didn’t warn you! If you have read any of my earlier posts regarding Kelley Armstrong, then you know that I am a huge fan. Armstrong hooked me for life after her first novel Bitten, and I know that when I pick up her books, that I’ll be entertained. That is not to say that I love all of her works the same, but I know that even if the story line isn’t my favourite, it will still be well written. SYNOPSIS – Twenty-four-year-old Olivia Taylor Jones has the perfect life. The only daughter of a wealthy, prominent Chicago family, she has an Ivy League education, pursues volunteerism and philanthropy, and is engaged to a handsome young tech firm CEO with political ambitions. Omens is the first book in a series that Armstrong began in 2013. It is a departure from her Otherworld series, which introduced us to Armstrong’s perspective of the world of werewolves, witches, vampires and other supernatural beings. To be honest, even now that I’ve finished Omens, I still can’t quite put my finger on what supernatural vibes are going on other than there are hints of the occult and old superstitions related to paganism. Olivia, our protagonist of the story, seems to have the ability to foretell events that may happen through the interpretation of “old wives tales”. She seems unaware of why she has this talent, and throughout most of the book, she is trying to deny the importance of these superstitious beliefs which becomes increasingly difficult for her as the story progresses. Beyond this unusual talent of Olivia’s, I was really left wondering where Armstrong was headed with this story. Armstrong is very good at cliffhangers. Years ago, as I was reading Armstrong’s YA series, The Darkest Powers Trilogy: Summoning, Awakening and Reckoning, I was impressed with her skills for keeping her readers hooked from chapter to chapter and then from book to book. The way that Omens is wrapped up, you are definitely left wanting more, if only to figure out what the heck is going on in the increasingly creepy town of Cainsville, where our heroine ends up calling home. A town which seems to be under the ever watchful eye of the many gargoyles found around town, including some gargoyles that only come out at night. Did I mention that the town is creepy? In Omens, we are dropped into the life of Olivia Taylor-Jones, a member of Chicago’s high-society elite, who finds her life blown apart as she learns that nothing is really as it seems. Olivia is really Eden Larsen, who was adopted as a young toddler by the Taylor-Jones family. Her birth parents turn out to be notorious serial killers. Her widowed mother is too fragile for the media maelstrom that erupts after the world discovers Olivia’s true identity and goes into hiding, leaving Olivia on her own. In an attempt to avoid the paparazzi, as well as, protect her family and friends in Chicago, Olivia goes on the run and finds herself back in the small town of Cainsville, where she lived with her birth parents. Unaware of what appears to be preternatural machinations that draw her to Cainsville, Olivia goes about the business of finding a place to live and getting a job. The town seems to accept Olivia’s presence, unlike Olivia’s friends, family and even her fiance back in Chicago who cannot wait to be rid of her and the scandal that she has brought to their doorsteps. There are some interesting characters living in Cainsville, in particular the senior citizen contingent of the town. In terms of demographics, Cainsville definitely seems to have more seniors than children running around. The seniors also seem to be true “elders” of the town, and you get the sense that they are running the show. One character, however, seems to command more respect than the seniors and that is Patrick. He is a writer of paranormal romance, or so he says, but it is clear to Olivia that there is more to Patrick than meets the eye. Olivia senses a definite “don’t f@ck with me” vibe rolling off of Patrick, but she can’t quite put her finger on the why behind it. Then there’s Gabriel Walsh, who is the real enigma in this story. Is he just a money-grubbing lawyer, only interested in the fame and fortune that Olivia’s story can bring him? Or is he a tortured soul, unknowingly looking for redemption and salvation that only Olivia can provide? I found the development of Olivia and Gabriel’s relationship intriguing and I definitely want to see how Gabriel’s character evolves over the course of the series. I would be completely remiss if I didn’t mention the introduction of the character Ricky, who can only be a Charlie Hunnam look-a-like, and if you have ever watched the show Sons of Anarchy, you would understand why. Coincidentally, Ricky is the son of the head of a successful motorcycle club, just like Hunnam’s character “Jacks” in SOA. Ricky seems to possess many of Jacks’ charming qualities and resourcefulness which will undoubtedly be needed in the second and third book of the series. Ricky could also prove to be a possible love interest for Olivia, or at least the third of a potential Gabriel-Olivia-Ricky love triangle. Who doesn’t enjoy a good love triangle? At the end of Omens, some questions are answered, but so many more are left, which is the sign of a good writer. I’m very curious to see just what Cainsville is really all about and are Olivia’s birth parents murderers or is there something worse that they are hiding? It’s been a long time since Harry Potter for a lot of us and if the Dresden Files just aren’t getting it done The Magicians may just be your thing. The previews look amazing and look out for a show versus the book review coming soon from teachergirl73! S1 – Ep 1 Unauthorized Magic – Based on Lev Grossman’s best-selling book series, The Magicians follows Quentin Coldwater, a highly intelligent but socially withdrawn twenty-something secretly obsessed with a series of fantasy novels he read as achild about a magical land called Fillory. Beyond that, Quentin’s life is dull until he finds himself admitted to a very secret, exclusive college of magic in Upstate New York, where he receives a thorough and rigorouseducation in the practice of modern sorcery. However, magic doesn’t bring the happiness, adventure, and meaning that he thought it would…until he and his friends discover that Fillory is real. You know Darcy: rich, proud, standoffish, disapproving, one of the greatest romantic heroes of all time. But you don’t know this Darcy because THIS Darcy is a woman. In PREJUDICE & PRIDE, Lynn Messina’s modern retelling with a gender-bendy twist, everything is vaguely familiar and yet wholly new. Bingley is here, in the form of Charlotte “Bingley” Bingston, an heiress staying at the Netherfield hotel on Central Park, as is Longbourn, transformed from an ancestral home into a perennially cash-strapped art museum on the edge of the city. Naturally, it employs an audacious fundraiser with an amused glint in his eye called Bennet. Over the past couple of years, I’ve been making my way through various “reimaginings” of the works by Jane Austen. The Austen Project, has published three reinterpretations of Austen’s novels Sense & Sensibility by Joanna Trollope, Emma by Alexander McCall Smith and Northanger Abbey by Val McDermid. Of these three reimagined stories, I have read Emma and Sense & Sensibility, and sadly was left feeling a profound sense of disappointment after reading both novels. I am hopeful that when I get around to reading McDermid’s version of Northanger Abbey, it will redeem The Austen Project in my eyes, and give me hope that the yet to be published Pride and Prejudice, my all-time favourite of Austen’s works, will be worthy of its inspiration. Thankfully, my disappointment over both Trollope’s and Smith’s perspectives on Sense & Sensibility and Emma, have not put me off of reading the works of other authors who wish to pay tribute to Austen’s novels. In Prejudice and Pride by Lynn Messina, Austen’s most beloved story gets a 21st century re-boot which includes relocating the story to New York City, and some interesting twists and turns for the characters. In this tribute to Pride and Prejudice, Messina decides to play with her reader’s ‘sensibilities’ by doing a complete gender swap of all the major characters, with the one exception of Lady Catherine de Bourgh because no one could possibly mess with that character! There are many parts of this new and fresh take on Pride and Prejudice that I quite enjoyed. The descriptions of the various New York City locales were very well done and reminded me of why I love the city so much. All of the original story’s themes are present. Messina deftly weaves into her modern tale the consequences of how making a very bad first impression can lead to many more incorrect presumptions and misunderstandings. As the story of Prejudice and Pride unfolds, the misconceptions rapidly snowball out of control, leaving a trail of increasingly devastating results which ultimately is what will pull the reader in and keep them engaged until the end. There is one part of this re-imagined story that I had a difficult time overcoming and that was the gender swap. It is a really neat twist on the story and I was very curious to see how it would work when I first started reading the story. Unfortunately, I spent much of the novel thinking, “That wouldn’t happen in real life!” as Elizabeth Bennet’s personality traits were transferred into Bennet Bethle, a 21st century man. The effect of transferring Mr. Darcy’s qualities into Darcy Fitzwilliam, a young heiress, was less of an issue, but in the end I just found it really difficult to accept the gender swap as believable. The plight of Elizabeth Bennet and the rest of her sisters, living in the early 19th century England, simply cannot be applied to a young, educated male living in New York City in the present day. All of the Bennet women, including their mother, faced the very real possibility of losing their home and livelihood upon the passing of Mr. Bennet because there was no male heir in their immediate family. Bennet Bethle comes from a middle class background which granted makes him an unlikely suitor for an heiress with substantial wealth, but it is still not nearly the same disadvantage that Elizabeth Bennet and her sisters faced. This disconnect between the characters made it difficult for me to buy into the evolution of Bennet and Darcy’s relationship, as they eventually realize their love for one another. Overall, the story was enjoyable, and I applaud Messina’s attempt to tackle a project inspired by a much loved classic. 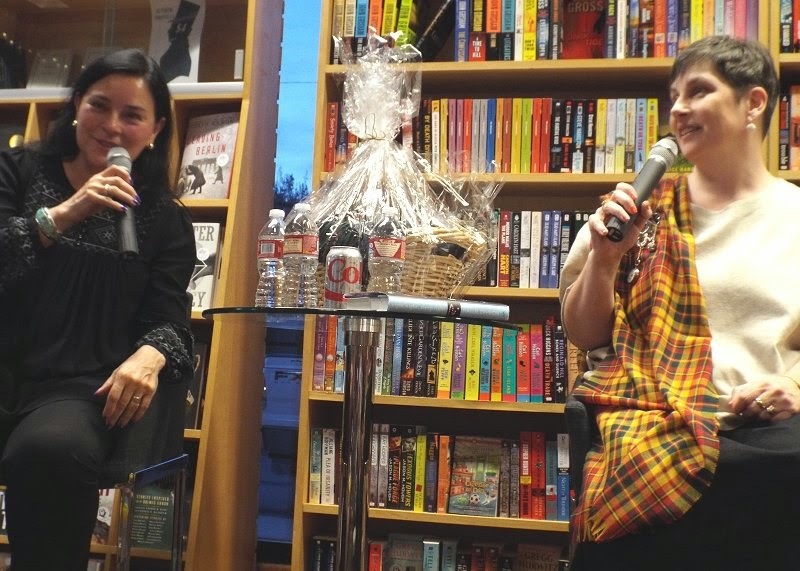 It cannot be easy taking on the challenge of modernizing a story such as Pride and Prejudice. I would definitely consider reading more novels by her. Lynn Messina is author of ten novels, including the best-selling Fashionistas, which has been translated into sixteen languages, and a series of Regency romance novels. Her essays have appeared in Self, American Baby and the New York Times Modern Love column, and she’s a regular contributor to the Times Motherlode blog. She lives in New York City with her husband and sons. It’s no secret that I’m an avid fan of the Outlander series by Diana Gabaldon, as well as, Ron D. Moore’s adaptation of the story for television found on the STARZ network in the U.S. and on Showcase here in Canada. What probably impressed me the most about Outlander’s first season was how the show’s creators manage to find two actors who were able to step into the roles of Jamie and Claire so effortlessly. I’m sure that was a concern for many fans, as we all had our own visions of Jamie and Claire, and getting the casting right was key if the show was going to get off the ground. The show’s outstanding scenery, music and the contributions from supporting cast members all came together to make Outlander’s inaugural season a huge success. Outlander’s story is a long one as those of us who are still reading the series, it has been eight novels and the story is still not over. It’s filled with romance, adventure, and the harsh reality of living in the 18th century which includes a far amount of violence. Near the conclusion of Outlander, the first novel, readers and television viewers alike were presented with a particularly horrific act that for readers of the novel will not soon forget. As Season 1 came to an end, we all knew what was coming as Jamie was left in the hands of Black Jack Randall in Wentworth Prison. From a pure production point of view, it was an incredibly difficult episode to pull off, the show’s creators did an amazing job. That said, I fear that there are images forever burned into my mind that I will never be able to erase! Okay, perhaps that’s being a little melodramatic, but I’m sure that there are others out there who agree with me. After many discussions around the proverbial “water-cooler”, I think that despite the rawness of the season finale, most people that I’ve talked with will be tuning into Season 2. I know that I certainly will be, and from the looks of the first trailer for Season 2, the production values certainly appear to be of the highest quality once again. I also have a soft-spot for Dragonfly in Amber, the second novel in the series and as a history major, 18th century Paris was my favourite time period to study. So, the question is, will you be watching? 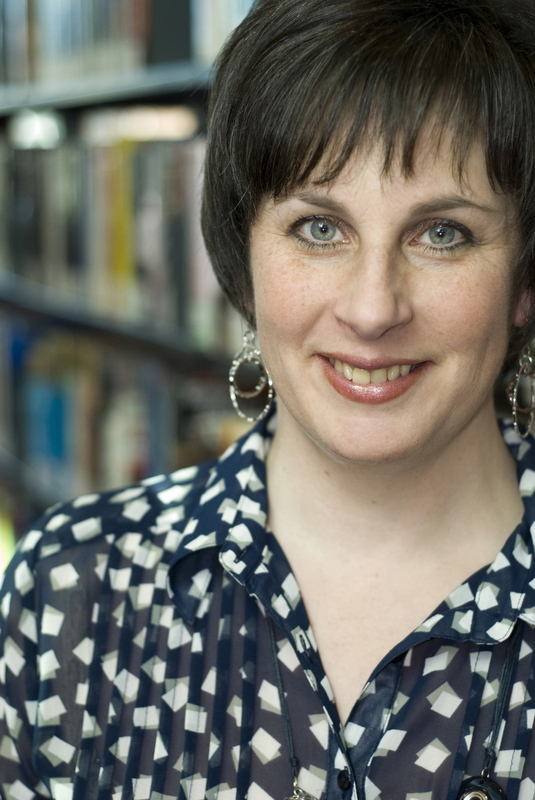 Susanna Kearsley is by far one of my favourite authors, and her being a Canadian is like the icing on the cake. After suffering through required Canadian literature in high school, i.e.The Stone Angel (shudder) I was ready to swear off Canadian authors altogether. A very distressing prospect since I’m a proud Canadian and believe we should support our arts and culture. The often seriously depressing overtones that seem to riddle many of Canada’s literary greats was more than I could handle. Isn’t real life hard enough on its own? Do we have to wallow in the extreme miseries which seem to follow the protagonists in Canadian literature? It is only cold part of the year and sometimes not even that in Vancouver! So when I discovered Susanna Kearsley via a recommendation from my BFF, I was pleasantly surprised and later as I consumed more of her novels, overjoyed at the fact that here was a Canadian author I really loved to read! What I love most about Kearsley’s books is the way that she simultaneously weaves the threads of two stories, one in the past and one in the present, pulling the reader often into a mystery that needs to be solved in both places. If you enjoyed Outlander by Diana Gabaldon, then you would probably enjoy Kearsley’s novels, even though they don’t involve time travel as such, they follow a similar pattern of flipping between the past and present stories with lots of intrigue and romance rolled into both. Her background and training as a former museum curator, ensures that her details are meticulously well-researched and authentic, which enhances her stories. Kearsley’s commitment to details means that she is also able to paint the most magnificent settings, which inevitably leaves me wanting to hop on a plane and head off to Scotland, or Wales or France to her latest location and go find my own adventures. From Goodreads – For nearly 300 years, the mysterious journal of Jacobite exile Mary Dundas has lain unread — its secrets safe from prying eyes. Now, amateur codebreaker Sara Thomas has been hired by a once-famous historian to crack the journal’s cipher. But when she arrives in Paris, Sara finds herself besieged by complications from all sides: the journal’s reclusive owner, her charming Parisian neighbor, and Mary, whose journal doesn’t hold the secrets Sara expects. As Mary’s tale grows more and more dire, Sara, too, must carefully choose which turning to take… to find the road that will lead her safely home. A Desperate Fortune begins in the present with a young woman named Sara Thomas, who lives in the London area and is at loose ends. She’s an unemployed computer programmer, with Asperger’s Syndrome, which falls under the umbrella of the Autism Spectrum Disorder (ASD). Individuals with an Asperger’s diagnosis, just like any ASD diagnosis can have wide-ranging symptoms impacting each person very differently. In Sara’s case, she seems to be very high-functioning, and as an adult has developed excellent coping mechanisms to help her get through daily life. Sara’s cousin Jacqui, a book editor, introduces her to one of her author’s, Alistair Scott, a historian in need of a code breaker to decipher a journal for his research for his latest book. It is at this point that Sara’s life takes a detour and she finally starts to live. Sara’s new job takes her to France to decode a journal by a young woman, by the name of Mary Dundas, who lived in France during the early 18th century and who’s journal holds important Jacobite secrets that Alistair needs. As Sara decodes Mary’s long forgotten journal, we start to see how the intricate the web of secrets and lies were for the Jacobites, the supporters of the exiled King James VIII of Scotland, who believed that the Stuarts were the “rightful” heirs to the British throne. As the young Mary, gets swept up into the intrigue, the reader is taken on a fascinating journey from Paris, through France and eventually ending up in Rome at the court of King James. Mary learns some heart-breaking lessons through her journey, and Sara begins to realize that her own life could have more fullness as she meets Luc, the neighbour next door, who manages to shake Sara’s belief system and show her all of the possibilities of the world. Overall, A Desperate Fortune is an enjoyable read, one that I felt improved as the story developed. At the beginning, I wasn’t grabbed in the same way as I have been in the past with Kearsley’s novels, such as The Winter Sea or Mariana, but as the plot filled out, I was completely engrossed in the story. Kearsley’s romantic flare manages to pull off the best PG-rated love scenes that I’ve ever encountered. 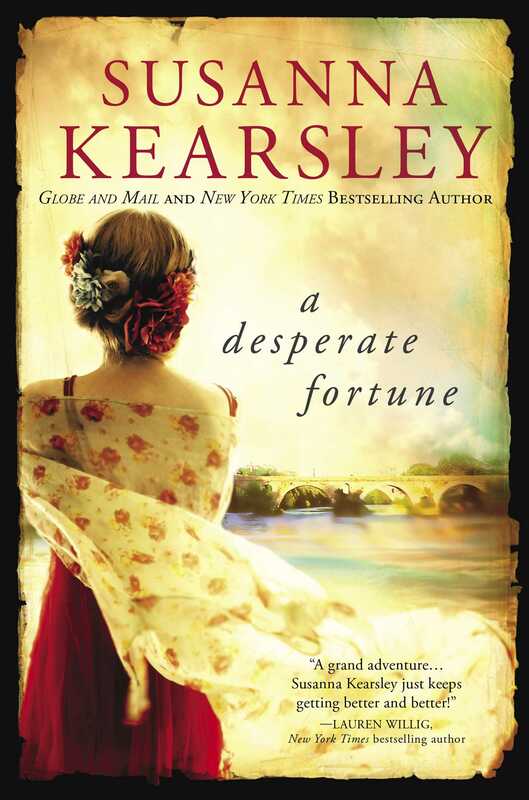 When I shared that musing with my BFF, her response was, “Why can’t she turn up the heat a little?” All kidding aside, Kearsley has once again delivered a novel ripe with romance, history, and intrigue. I particularly liked at the end of the story, Kearsley included a detailed explanation of how her characters came to be developed and I thought it was the perfect touch to what turned out to be a lovely novel.